Where should we look for extra-solar life? In a star’s habitable zone of course! 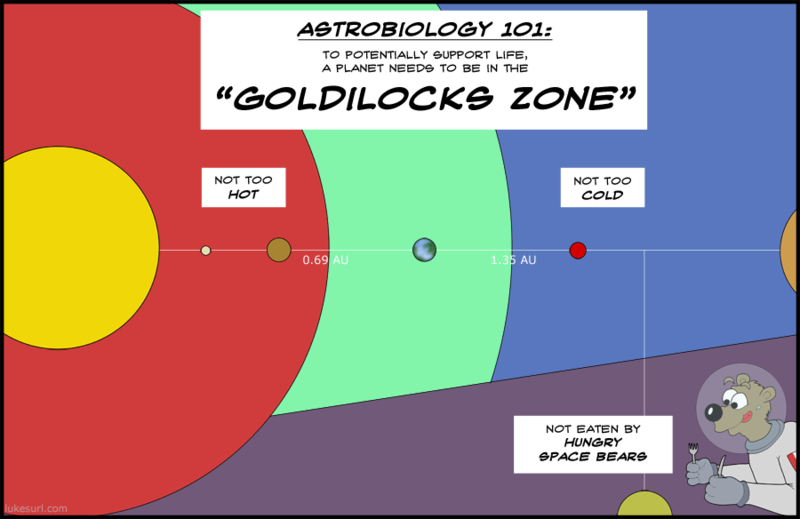 Any planet in that magical Goldilocks zone must host life, right? Well, not exactly. The habitable zone should really be called the liquid water zone. A planet with the right characteristics that orbits its star within the habitable zone can have liquid water on its surface. So don’t be tricked by reports of discoveries of habitable planets! Like this one, or this one. What have been discovered are habitable zone planets. We don’t know anything about what these planets’ surfaces or atmospheres actually look like. For example, the Moon is basically a habitable zone planet. It orbits the Sun at the same distance as Earth and it’s almost as big (its radius is about one quarter of Earth’s). But the Earth is a lush paradise and the Moon is a lifeless barren crater-field. You need more than the right orbit to have life. Well, for today let’s delive into where the habitable zone is located. Any planet with liquid water on its surface must have an atmosphere. Having liquid water actually requires a minimum amount of water vapor in the atmosphere pushing down and maintaining the liquid layer. If there is too little pressure then water can only be solid (ice) or gas (water vapor). [If you must know, Mr or Ms Geekypants, the minimum pressure is 6.1 millibars.] So, a planet with liquid water must have some water vapor in its atmosphere. Let’s start off with a nice simple planet. Planet Aqua has a solid surface covered by a reservoir of water. The water can exist in three states; 1) a pure water vapor atmosphere over the surface, 2) a liquid (ocean) layer with a water vapor atmosphere, or 3) an icy layer with a (thin) water vapor atmosphere. If planet Aqua is too far from its star its water freezes. If planet Aqua is too close to the star the water in its atmosphere can’t condense and is doomed to remain as vapor. At the right range of distances, planet Aqua will have liquid water on its surface and an atmosphere of water vapor. This is that magical place that I’ll continue to call the liquid water zone. Planet Aqua’s liquid water zone can be hotter than you might think. Liquid water can exist between zero and 374 degrees Celsius (32-705 deg Fahrenheit)! Any hotter and there is no more “liquid” — the water exists as a supercritical fluid. This temperature range sets the inner and outer edges of the liquid water zone. The heat loving-est life on Earth lives at about 130 C. The vast majority of the liquid water zone’s real estate would be uninhabitable for Earth life! 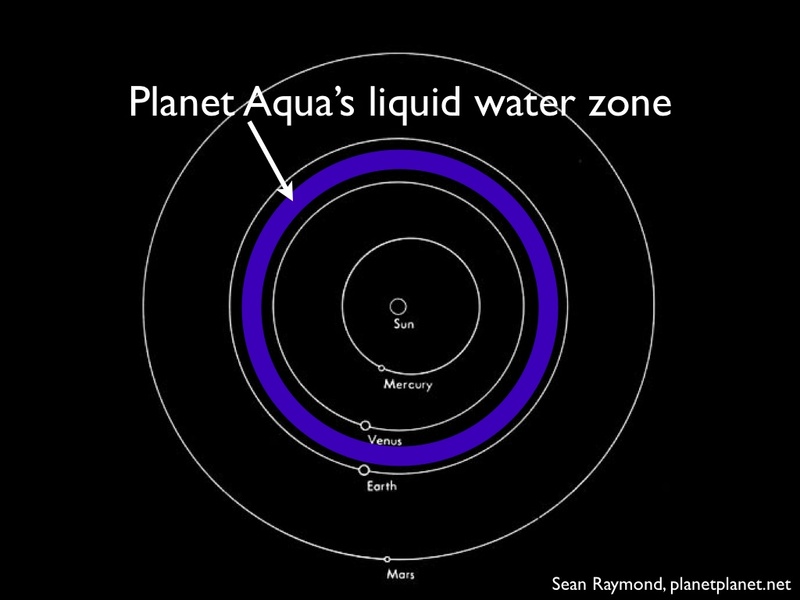 Planet Aqua’s liquid water zone is surprisingly narrow. This comes about from a strong greenhouse feedback. Water vapor is a greenhouse (heat-trapping) gas that heats the planet’s surface. Thicker atmosphere, more heating. A hotter planet Aqua is, the thicker its atmosphere and the stronger its greenhouse heating. This effect is so strong that it plays out in a very narrow range of orbital distances. The liquid water zone is confined to between the orbits of Venus and Earth. If planet Aqua was on Earth’s orbit it would be a frozen iceball! The liquid water zone for a simple planet that only has water vapor in its atmosphere. The outer edge of planet Aqua’s liquid water zone is firm, but the inner edge can vary. For instance, clouds can cool the planet down and push the inner edge of the liquid water zone interior to Venus’ orbit. This also happens if planet Aqua’s water budget is limited. Things can get even more complicated. Real planets have clouds that are unevenly distribution that can heat or cool the surface. Polar ice caps can exist on planets with liquid water. But we’re not going to get into any of that stuff now. Earth is not in planet Aqua’s habitable zone! What’s up with that? Tune in to part 2 of the habitable zone series, where we’ll complicate things up a little more (but not too much)! September 16, 2013 in Conditions for habitable planets.